What is the purpose of the Mayfair chair? 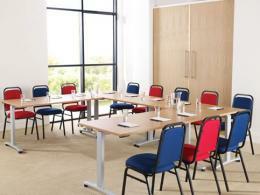 The Mayfair chair is a classic conference, events and catering chair. It is well-suited for heavy commercial use. 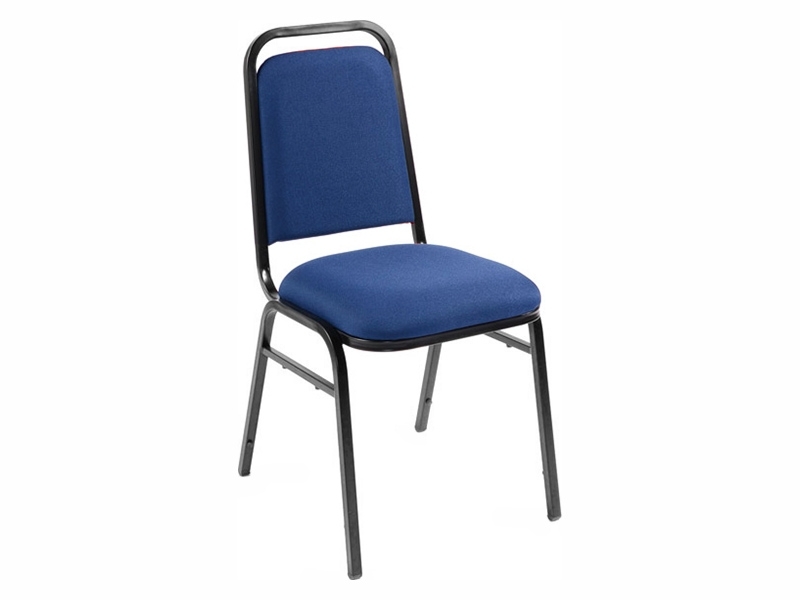 Its construction of black powder coated tubular steel makes the chair both very strong and stable but also very lightweight for easy transportation from storage to the meeting facility and back. The cloth upholstery is available in either red or blue. The upholstery is a densely woven synthetic material that is tear and stain resistant and will stand up to years of heavy use without wearing through. There are steel side supports between the legs for added stability. The back rail of the chair is taller than the chair back, which allows a hand-hold through the rail for easy movement and adjustment of the chair. Each leg has a molded plastic foot inserted in the bottom which allows smooth sliding across hard floors. These chairs can easily be covered with other materials for events like weddings and other banquet settings where coordinated design concepts are employed. While these chairs are primarily for conferences and other large events, the Mayfair chair could also give good service in a classroom, conference room or meeting room setting. Where can this product be used? The Mayfair chair is best suited for large banquet rooms and dining facilities, University, college and school cafeteria facilities, large meeting rooms and auditoriums for public events, concerts and lectures. Who might use this product? 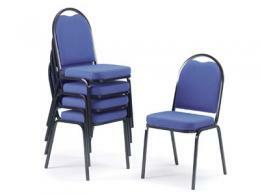 The Mayfair chair is appreciated by discerning event-goers and banquet diners all over Britain. This chair is backed by a standard 1 year parts & labour warranty. If there should be any performance or appearance problems caused by manufacturer’s defect, the warranty will cover replacement or repair. Delivery times for the product range from 5 to 15 days within Britain. The Workplace Depot offers its Price Promise – we will beat any competing price on the same item. We also feature a liberal returns/exchange policy within 14 days of purchase.